Litchfield Country Club was among the eight original courses built on the Grand Strand. Furthermore, it was the first course built in the Pawley’s Island/Litchfield area. Litchfield remains true to its original design by Willard Byrd. Opening for play in 1966, the course has maintained its original features. These include player-friendly green side pathways for bump and run approach shots. Numerous doglegs also feature prominently on the course. Conde Nast Traveler ranked Litchfield Country Club as one of the “world’s 50 best,” but the course comes out at a fair price. The gracious charms of this exclusive country club “signature course” bring enjoyment to all visiting golfers. The mature tree-lined fairways wind amid giant oaks and shimmering lakes of a former Carolina rice plantation. This created an equally extraordinarily challenging “country club” experience. The traditional-styled layout shines as the flagship of the historic plantation courses. Due to its country club atmosphere, Litchfield Country Club makes a great addition to your South Myrtle Beach package. In addition to the historic charm, golfers of all abilities will enjoy the layout, especially the fairness of the design. 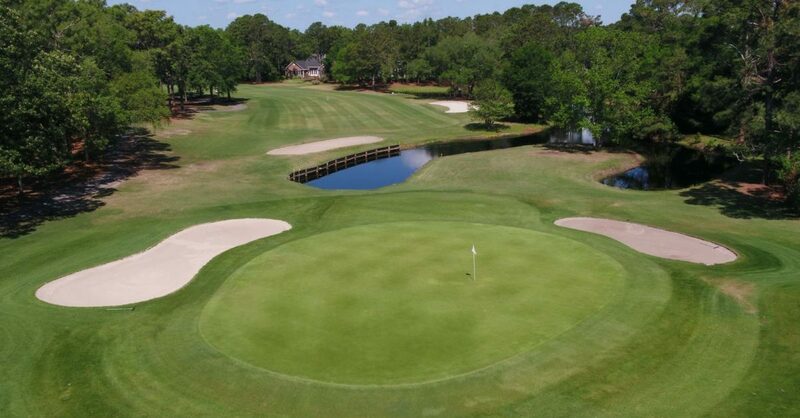 Litchfield packages well with the other great courses in the Southern tip of Myrtle Beach. Bring your camera and take back memories of the gorgeous Oaks lining this course.